Despite the negative and harsh reviews plaguing The Emoji Movie, it could still manage to pull off a number one debut weekend. Currently the animated movie starring T.J. Miller is neck and neck with Christopher Nolan's Dunkirk, which are both tracking at $27 million a piece. Dunkirk is on it's second weekend and trying to pull off two number one wins in row, a feat that hasn't happened since the DCEU's Wonder Woman opened 7 weeks ago. 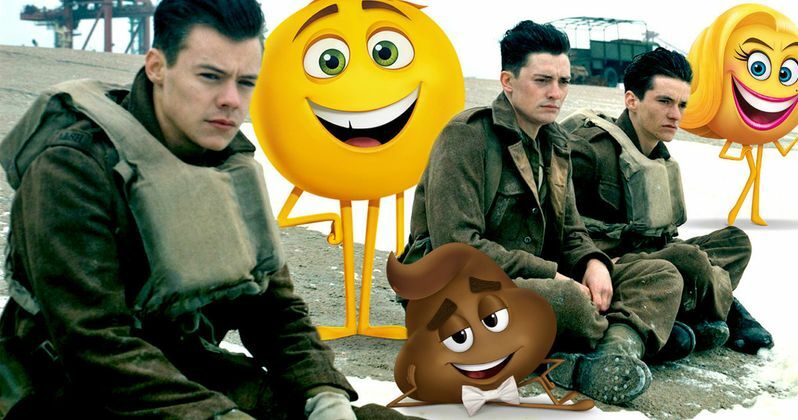 Box Office Mojo reports that The Emoji Movie is just ahead of Dunkirk for the Friday estimates at $10,500,000 and $8 million, respectively. Though the animated movie is currently doing slightly better, both movies are on track for $27 million, which is impressive for Dunkirk since it's in it's a second week and could actually end up beating The Emoji Movie by weekend's end. Not far behind is David Leitch's Atomic Blonde starring Charlize Theron at an estimated $7 million. The R-rated espionage movie is tracking at $18 million, putting it in direct competition with the R-rated comedy Girl's Trip, which is also in its second week. Atomic Blonde may not have what it takes to beat out Girl's Trip and may end up at number 4 for its debut weekend if Girl's Trip keeps its steady flow going. Elsewhere, Spider-Man: Homecoming starring Tom Holland is still holding strong at number 5 after earning an estimated $4 million on Friday, which brings the domestic total to just over $275 million while Matt Reeves' War for the Planet of the Apes hangs on at number 6 at an estimated $2.9 million for Friday. Despicable 3, Valerian and the City of a Thousand Planets, Baby Driver, and Wonder Woman round out the top ten for this week. The Emoji Movie has met some harsh criticism as a blatant rip-off of a Pixar movie with a tired, rehashed story. But critics aren't the ones going to see the movie as children all over the United States could give the animated movie a number one debut. Yesterday the movie was in the news for its 0% rating on Rotten Tomatoes, but has since gone up to a whooping 6% currently as parents vent about having to sit through the experience that has been called, "boldly bad... also boldly boring," with one parent saying that it "makes me want to die." Other reviews have been more favorable saying that movie isn't great nor is it bad, it's just "meh." When it comes down to it, The Emoji Movie is for kids, not adults and it shouldn't be compared to Dunkirk because that's impossible. So for now, the kids will flock to theater this weekend and possibly end up pushing the animated T.J. Miller movie into the number one position while also earning about half of its initial $50 million dollar budget. We'll have to wait until the end of the weekend to see where Dunkirk and the Emoji Movie end up as well as the race for number three between Atomic Blonde and Girl's Trip.